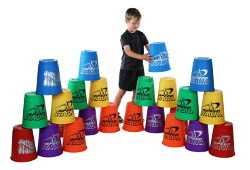 Sport Stacking involves up stacking and down stacking Speed Stacks in pre-determined formations at lightning speeds on a StackMat, either solo against the clock or head-to-head against other students. Active and healthy, sport stacking improves ambidexterity, concentration and hand-eye coordination. A university study has shown that sport stacking increases bilateral proficiency - equal performance on both sides of the body - which helps develop awareness, focus, creativity and rhythm. Already part of P.E. curriculums in over 12,000 schools worldwide, sport stacking is the new competitive sport of speed and skill. 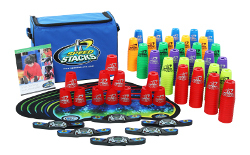 Speed Stacks are the official sport stacking equipment of the World Sport Stacking Association (WSSA). Speedstacks sold on Kidology may be shipped within the United States and Canada only.